The Sabbath has been a welcome respite after being on the run all of the last week. 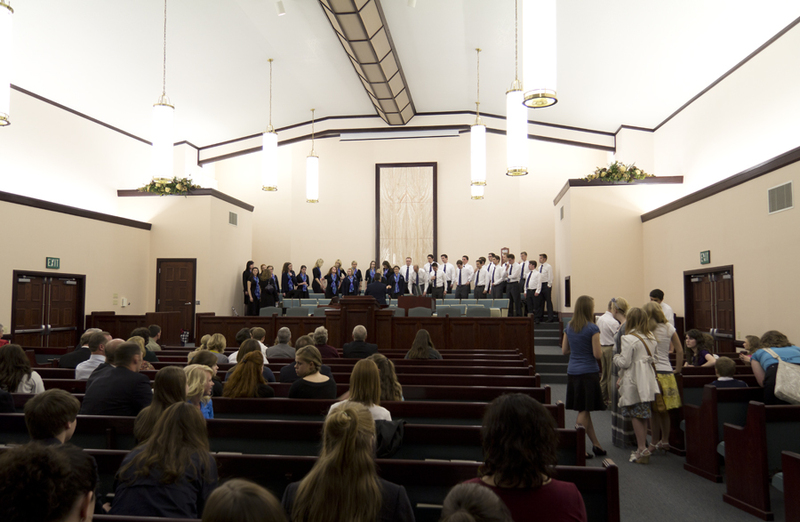 The choir was divided between several LDS wards, attending church meetings with their host families. Some lucky Singers were able to sleep in a little longer before church at 11, but I’m sure the ones who went at 9 managed to fit in a nap during the afternoon. Everyone had the day to do non-group activities before we head into the final week of tour. Last night’s concert was the halfway mark of concerts; we have five more to give this next week. I know from past visits what a beautiful area surrounds Colorado Springs; sadly, the clouds are so low that we really cannot see much today. As a beautiful spring May Day, today has failed abysmally. Nevertheless we will dust off our winter coats and keep smiling through the snowflakes and shivers. It does look as if the weather will improve dramatically starting Tuesday. A note about the chapel—I don’t know the complete story, but at some point President Hinckley decided that our chapels needed to be built out of better materials and designed better. He took on the task personally, and designed a beautiful chapel that has been built in 18 places. This one is gorgeous, and the photo really doesn’t do it justice. The rectangle behind the choir is granite, and cut so that the grain is a mirror image in the 8 pieces. It has beautiful soft colors, wonderful wood and carpentry, so many details that come together so well. And then it was decided that the cost was too great. Too bad. If you’re ever in the area, go to meetings here. Beautiful.